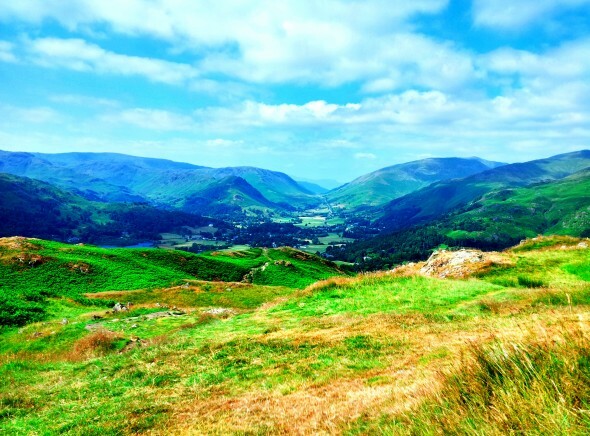 Rydal: the valley where rye is grown. We travel past Windermere, to Ambleside and beyond; a line of cars glittering in the unexpectedly ferocious heat. To the left, a now familiar lay by, close to an idling ice cream van, striped green and yellow, dappled like the road by the trees above. I choose a sharp tasting cider lolly covered in stinging ice, and the man, recognising us now, asks how we are. I hear in his welcome the voice of this valley: welcome back to the land. Welcome home. Plunging down then, across the road into the woods; in to the cool of the sighing trees and the droning buzz of the insects. We follow shallow streams past drowsy Saturday picnickers, to where they converge with the river Rothay, and up, through drifting clouds of gnats, whirling like dust blown from a book. They part and then follow as we pass. At the top of the path we break out of the trees into bright, hot sunlight. Wainright walked here; his love of the place skipping from the pages of his walkers guides. I think of him, and of Wordsworth; not the poet, but the walker, the land as muse and companion. Swimmers are bobbing, head and shoulders refracted by the shimmering water. Families line the narrow beach, dogs and children jumping and playing, kicking up pebbles. We cross the bridge suspended above water and thick-swaying clumps of river weed, and immediately we climb. It is hot and exhausting work. The exertion is a meditation. Each burning breath is paid for in the moments in which I stop, sweating, gulping air. In those moments of stillness after exertion, the calm is let in. Heartbeat slows; pure air is dragged through my throat and then that too slows, becomes still. The land stretches down and away from the souls of our feet, and connects us to everything below and above; standing on the same rock that I can see scraping the belly of the clouds across the wide valley. This is a simple and encompassing joy, and there is nothing and everything here in the bowl of this hazy landscape. There is knowledge that the warm, flat slates I place on the cairn near the first summit, the horsefly who announces her presence with a stinging bite and is slapped away: we are all the same. Each birthed in broiling heat, our elements carried across millennia to meet here for a shared moment, touched by the same breeze; so close, in the vastness of space and time, that we are each barely distinguishable from the other. We climb again, until we reach Rydal Cave. 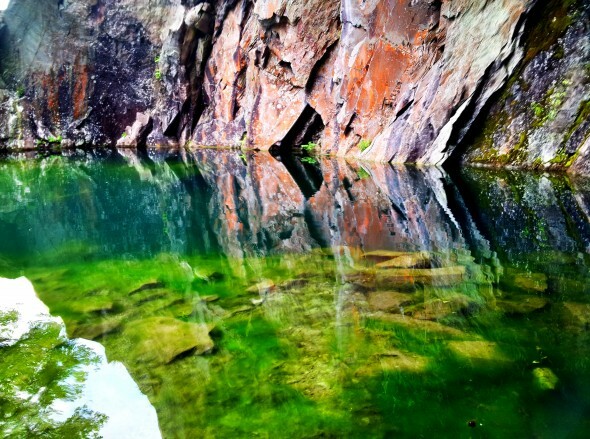 Hollowed out by slate miners, the cave stretches back into the dark, water pooling to create a large blue and red pond filled with minnows. Its curved walls are inhabited by swallows, who dart out, calling, over the water, scattering the fish below. The space creates an amphitheater, and as we sit in the shade in the rocks to eat, three hikers take off their packs and begin to sing, their voices deep-rich and ringing. It is unexpected and beautiful. I close my eyes and imagine it is the voices of the quarry men, still bouncing from the walls. We leave as they sing, following the yellow flash of bobbing grey wagtails up over the side of the cave, hauling ourselves up the rock in the heat. At the top of this section the ferns are now waist high, narrow paths through maintained by sheep and walkers. Above us, they part and join as they cross the hills; desire paths, each stamped out by a million differing journeys. Below, they join other paths, some dictated for now and others still being created. It is possible to see the dying days of ancient thoroughfares, and the birth of new ones. Out beyond Rydal water runs myriad routes: the main road, the sheep ways, the foot paths and fleeting scars etched across the water by boats and birds. Somewhere, I know, is the corpse road that stretches from Ambleside to Grasmere; its charges motionless now in leafy churchyards, their walking done. Foxgloves are in full flower here on the high slopes, pink and tall for the bees to find. There is another scramble, up and over formless spoil heaps from the quarries, their mounds now woven in golden grasses. New landscape, scarred, but reclaimed, that leave us gasping hot air again. 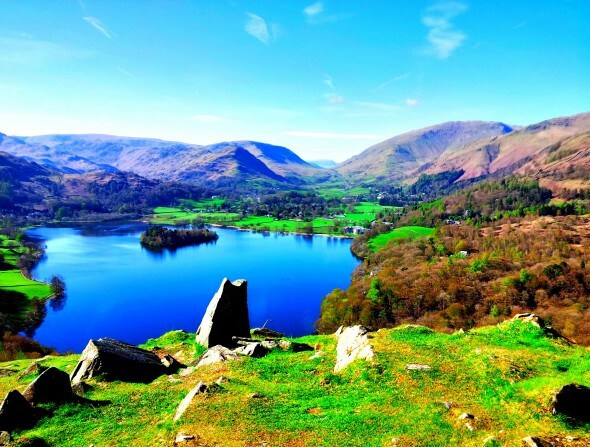 We reach the small stone trig, and drink in the view of Windermere to our left, and Grasmere to our right, and beyond, the Vale; steep sided crags and soaring hills. We lie there on our backs for a long time, staring up into the blue-grey haze. There are deep voiced ravens overhead, and the constant drone of insects buzz a mantra to the hills. 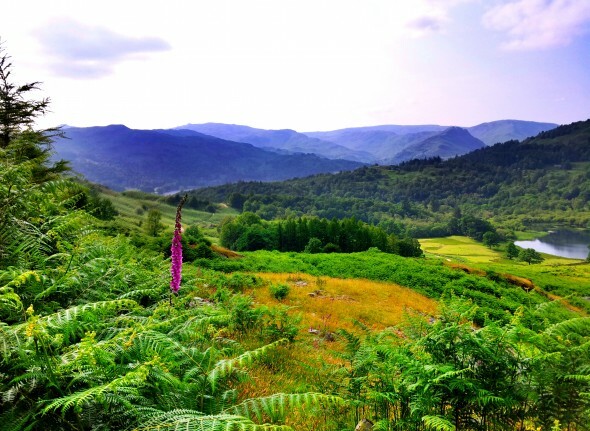 When we stand and begin the climb down, it is by a path of rubble and roughly hewn steps; vast sweeping views down the Vale of Grasmere and somewhere below, Dove cottage. We slide over loose rock. The descent is fast, and we move down from steep slopes over the lake, to cool woods. Meadow-sweet is beginning to gently foam white, late this year. I pick a little, feel it feathery on my tongue and enjoy the astringent, root beer taste. 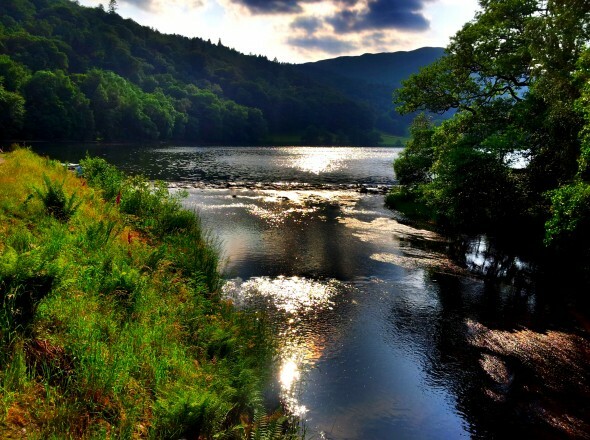 In the late afternoon, we clamber down the edge of the lake to a small pebble beach, pull off shoes and socks and plunge into Grasmere’s cool, dark water. 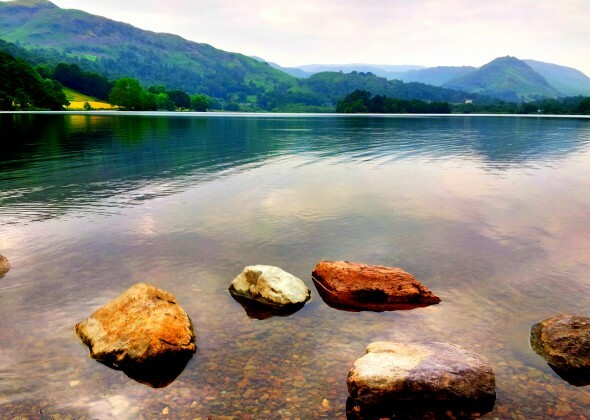 The lakes have finally, fleetingly absorbed enough heat to swim comfortably, and there are small groups of swimmer scattered from beach to beach; each staking our temporary claim on our own secluded strip of pebbles with walking boots and discarded trousers. This is a rare and precious pleasure in England; to be a body suspended, floating at the foot of the hills. There is no better way to know the land: to be utterly enveloped, dwarfed and supported by it. This year, as every warm year, people have tragically died swimming or jumping in our waters, and the usual, understandable warnings to abstain have been issued. But far, far more swim than sadly die, just as we do in the sea, or walk on our paths and roads. How much better it would be if, instead of being told not to swim and doing so anyway, our children would be taught how and where to do so more safely, just as we have for centuries before. How valuable it is to be taught where not to jump, how to recognise a rip tide, how quickly depth and temperature might change, where not to venture, how to avoid or cut away weed: these lost languages that make us more vulnerable strangers in our own hills and waters. After about an hour of swimming; of bobbing alongside curious young families of ducks and jumping as dragonflies skim the water close to our noses, we head back to the beach, drag towels over goose bumped skin and pull on boots. I am reluctant to make the journey home; to cut the day’s umbilical cord. These days are halcyon; in this late golden sunshine, this insect drone, there is pure and unashamed Romanticism. We carry them with us, and they nourish us, long after they are gone.